Enterprises worldwide are looking for ways to increase productivity, reduce maintenance costs, reduce downtime, increase security and provide new types of services to their customers. Many of them are using Internet of Things (IoT) solutions to improve their critical business processes and drive innovation across their product lines. In order to effectively deploy an IoT solution, enterprises will often use an IoT edge platform. IoT edge computing is a technology architecture that brings certain computational and analytics capabilities near the point of data generation. These IoT edge platforms provide the management capabilities required to deliver data from IoT devices to applications while ensuring that devices are properly managed over their lifetimes. Enterprises face a number of challenges when deploying IoT solutions. For example, most manufacturing plants have many brownfield assets thus needing an IoT solution that supports myriad legacy communications protocols. In addition, the heavy data flows from connected devices can increase data transmission costs and undermine total project ROI. And, because most enterprises have separate business units for various products, customers purchasing new IoT-enabled solutions might be inconvenienced with multiple UI. In order to overcome these challenges, enterprises should carefully evaluate how an IoT platform handles devices and data. According to MachNation, the leading independent testing and research firm specializing in IoT platforms and middleware, enterprises must choose leading IoT edge-capable platforms that speed time-to-market, but also provide the platform sophistication and completeness to support ongoing development needs. 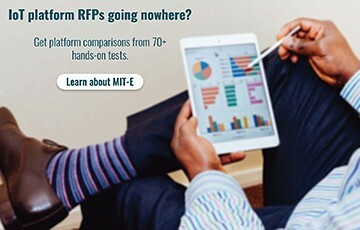 Using data from MachNation’s IoT Test Environment (MIT-E), enterprises can compare actual, hands-on benchmarking test data from competing platforms in the market. The quality of a platform chosen by enterprises is important because developers and operators rely heavily on an IoT platform to perform numerous tasks. Many enterprises take advantage of an edge-based architecture for their industrial IoT solutions. 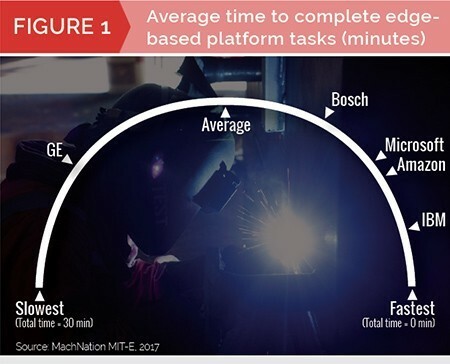 In MachNation’s IoT platform test and comparison environment MIT-E, we have found that a significant percentage of platform users’ time is spent completing routine tasks. For example, the fastest IoT platforms can take 1/10th the time to complete common edge tasks than the slowest platforms. Given the large number and variety of devices supported by an IoT platform, reducing task time has a material impact on ROI. By digging more deeply into our MIT-E data, MachNation has found that most of a platform user’s time is spent creating visualizations to gain insight from IoT data. 35% of a user’s time is spent creating dashboards with filtered alerts. And 16% of a user’s time is spent viewing sensor data for an individual device or a group of devices. Data from an IoT platform are critically important, so the ability to assemble dashboard sensor data and alerts are key. In addition to scoring tasks in MIT-E based on the time it takes to complete a task, MachNation scores vendors in MIT-E against a set of criteria including sophistication, completeness and ease-of-completion. A higher score means that a vendor’s platform for that particular task is better suited to a platform user than a vendor’s platform with a lower score. 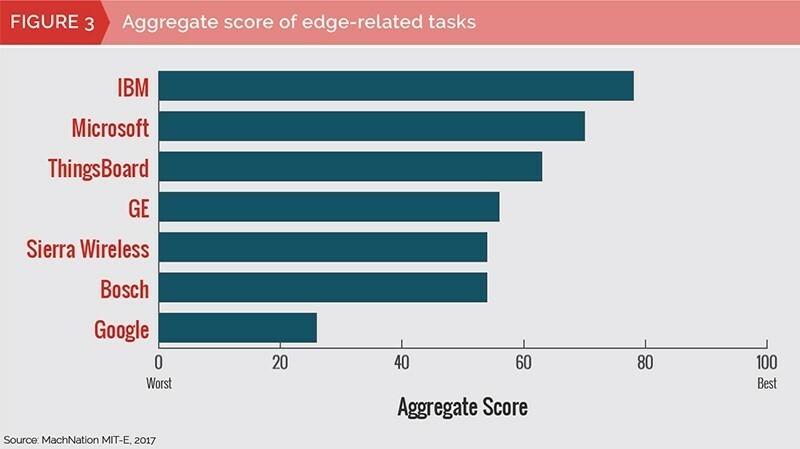 Platforms from IBM (IBM Watson IoT), Microsoft (Microsoft IoT) and Amazon (AWS IoT) have received higher edge-based task scores in MIT-E than other vendors’ platforms. Platforms from ThingsBoard (ThingsBoard.io) and GE (GE Predix) also have relatively high edge-based task scores, however, it requires vastly more time to complete edge-based tasks in GE Predix than on IBM Watson IoT, AWS IoT and ThingsBoard.io. This means that while the GE platform has relatively good edge-based capabilities and sophistication, the solution is complex to implement. 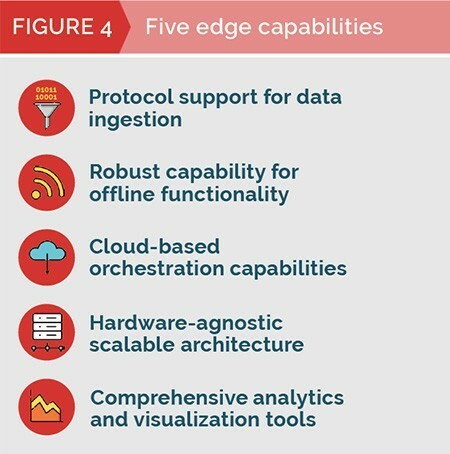 Understanding the edge-based capabilities of IoT platforms is critical if enterprises want to knowledgably pick the best platforms for their IoT solutions. Enterprises must choose platforms that provide data storage with normalization, rules-based event processing and edge-based integrations. According to MachNation definitions, IoT edge computing is a technology architecture that brings certain computational and analytics capabilities near the point of data generation. IoT edge computing enables certain processes to occur in an optimal location to create more secure, reliable and scalable IoT deployments. 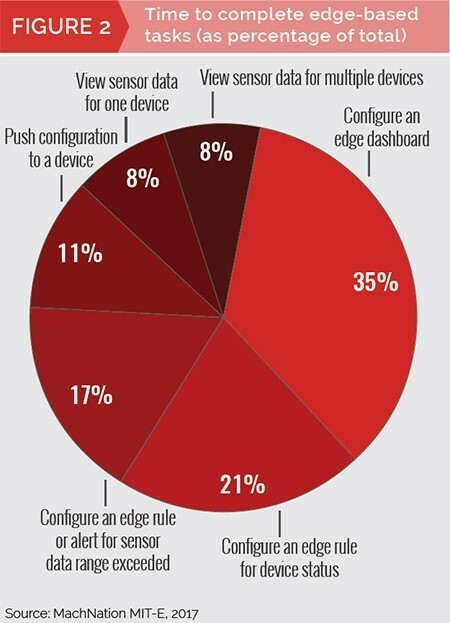 An IoT deployment using edge computing takes advantage of connected IoT devices or gateways that offer functionality in areas such as device integration, data ingestion, data processing, analytics and device management. Enterprises must choose leading IoT platforms that support an extensive mix of protocols for data ingestion and ensure enterprise security. The list of protocols for industrial-minded edge platforms generally includes brownfield deployment staples such as OPC-UA, BACNET and MODBUS as well as more current ones such as ZeroMQ, Zigbee, BLE and Thread. Equally as important, the platform must be modular in its support for protocols, allowing customization of existing and development of new means of asset communications. Finally, leading vendors provide encryption, authentication and data protection functionality to address elevated enterprise security requirements of connected, mission-critical hardware. Enterprises must choose leading IoT edge platforms that provide offline capabilities in four functional areas. First, edge systems need to offer data normalization to successfully clean noisy sensor data. Second, these systems must offer storage to support intermittent, unreliable or limited connectivity between the edge and the cloud. Third, an edge system needs a flexible event processing engine at the edge making it possible to generate insight from machine data. Fourth, an IoT edge-enabled platform should integrate with systems including ERP, MES, inventory management and supply chain management to help ensure business continuity and access to real-time machine data. Leading IoT platforms allow manufacturers to run the same software stack at the edge and in the cloud. Enterprises must select IoT platforms that offer cloud-based orchestration for provisioning, monitoring and updating of connected assets. Leading IoT platforms should provide factory provisioning capabilities for IoT devices. These API-based interactions allow a device to be preloaded with certificates, keys, edge applications and an initial configuration before it is shipped to the customer. In addition, platforms should monitor the device using a stream of machine and operational data that can be selectively synced with cloud instances. Finally, an IoT platform should push updates over-the-air to edge applications, the platform itself, the gateway OS, device drivers and devices connected to a gateway. Enterprises must select IoT platforms that are capable of running on a wide range of gateways and specialized devices. And these platforms should employ the same software stack at the edge and in the cloud allowing a seamless allocation of resources. Platforms should support IoT hardware powered by chips that use ARM-, x86-, and MIPS-based architectures. Using containerization technologies and native cross-compilation, the platforms offer a hardware-agnostic approach that makes it possible to deploy the same set of functionality across a varied set of IoT hardware without modifications. Enterprises must choose IoT platforms that offer out-of-the-box capabilities to aggregate data, run common statistical analyses and visualize data. These platforms should make it easy to integrate leading analytics toolsets and use them to supplement or replace built-in functionality. Different IoT platform users will require different analyses and visualization capabilities. For example a plant manager and a machine worker will want to access interactive dashboards that deliver useful information and relevant controls for each of their respective roles. Having flexibility in analytics and visualization capabilities will be essential for manufacturers as they develop IoT solutions for their multiple business units and operations teams. Enterprises worldwide are increasing security, improving productivity, providing higher levels of service and reducing maintenance costs. Many are adopting IoT solutions to improve their critical business processes. 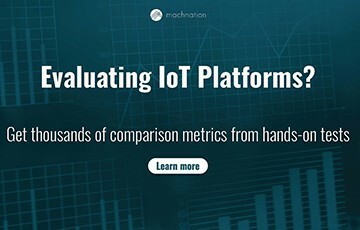 To ensure that they adopt leading IoT edge-based platforms, enterprises should rely on detailed, independent, hands-on benchmark data such as the data in MachNation’s MIT-E.
MachNation is the only insight services firm exclusively dedicated to covering the future of Internet of Things (IoT) middleware, platforms, applications and services. MachNation specializes in understanding and predicting these technology sectors including their impact on digitization, hardware, communication services and support tools. MachNation specialists have provided guidance to the majority of the world’s leading IT and communications firms. With 100s of self-proclaimed IoT platforms in the market, the only way to truly know each platform is to use it. MIT E (MachNation IoT Test Environment) compares IoT platforms, producing 1000s of data points rating 70+ developer and operator workflows. The post IoT Platform Test Lab Data for Industrial Entreprises appeared first on IoT Business News.